Japanese tea cups are known as yunomi chawan or simply yunomi. They are for drinking loose leaf teas such as sencha or gyokuro. Although they do not have handles, they are distinct from the Japanese tea bowls used for drinking matcha. While tea bowls are short and wide to allow for the vigorous whisking required to make matcha, yunomi are almost always at least a little bit taller than they are wide. They also typically have a small, well-defined foot along the base. They became popular for tea drinking between the 17th and 19th centuries, when drinking loose-leaf sencha tea began to take off as an alternative to the more rigid, formal matcha tea ceremony. Now, they are available in a dizzying variety of shapes, colors and designs, ranging from the traditional to the modern. They can be beautifully rustic with a handmade feel, or more refined, like this 8 ounce green salsa Japanese Tea Cup from Amazon.com. Do not fill the cup completely full. Stop pouring when the hot tea is about a half-inch below the rim of the cup. Do not pick the cup up by the sides. They will be hot. Instead, pick it up by the rim, resting your little finger on the foot of the cup to keep it steady. If you don't overfill the cup, the lip and the foot will be cool enough to touch comfortably. When you buy yunomi, look for a cup that is well-made and that feels good in your hand. Similar to tea pots, the choice of Japanese tea cups depend on the type of tea you are drinking. 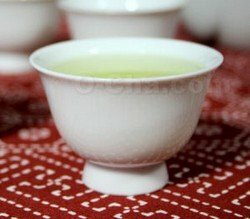 The rule of thumb is to use small cups for the higher grades, such as a gyokuro. Sencha cups are typically small and shallow. Also, get a cup that is white inside so that you can admire the emerald green of the tea liquor. For example, this porcelain white tea cup from will be suitable. It has a delicate, refined look. The plain white inside is a pleasant contrast to the emerald green of brewed sencha, and allows you to fully appreciate the color of the tea as you drink. If you are considering getting a set of tea cups, take a look at this Japanese Teacup Gift Set from Amazon.com. It is made of fired clay, with an earthy, moss-green glaze that is completely in harmony with the rustic, handmade design. It is a wonderful example of the rustic simplicity of many yunomi. There are so many different Japanese tea cup designs available that you should be able to find a cup to match your every mood. They are also available in animal shapes, in richly detailed cast-iron (like this Japanese Cast iron Tea Pot Cup Set ), and even with scenes from Japanese manga painted on. In Japan, it is normal to have an eclectic collection of attractive tea cups, so you do not have to worry about finding a matched set. Meoto yunomi, also called "married couple" tea cups, would be a cute gift for a couple or for your significant other. Meoto yunomi is a set of 2 matching yunomi, with one tea cup a little bit bigger than the other. The smaller cup nests in the larger cup for easy storage.